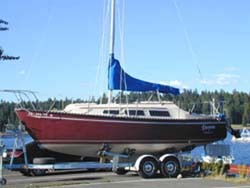 Continuing to refit our C26 for an upcoming month long cruise in the San Juan Islands. I started on our 12v system and found a nightmare of wires (Taped up and unrecognizable leading to the cabin switch panel... One MAIN problem, is that the switches were not labelled except for Acc. (Accessory) There's a very good chance that the functions for these switches won't match others, but I thought this would be a good place to start. (I'm assuming that you pull to turn on, and push to turn off? My number one goal is to eventually rip out every single wire on board and start over, using "Proper" buses, breakers, fuses etc and marine grade tinned wire, correctly color coded at the correct gauge. Been reading like crazy and searching wiring diagrams and I think I found the culprit... My biggest concern are the two "medium sized" wires leading to the switch panel... Both are black!!!! I traced one that was with the engine starting positive cable, so my educated guess (God I hate guessing when it comes to electrical! ), is that the other wires is negative. I'm disconnecting anything that is polarity sensitive (LED lights, VHF, Instruments etc... The incandescent lights will work if polarity is reversed. OK... time for a beer and taking the rest of the day off. Sorry for your pain. My dc wiring is very simple. A circuit for cabin lights, one for nav lights, and one for accessories ( I added a power socket and a few USB charging ports. I used most of the original wiring, but I converted all bulbs to led. I also added a switch above the head door going to the mast to switch between steaming light, and anchor light. I would love to help you trouble shoot if we weren't across the country. Good luck. Solar charge controller, twin bank 120v AC charger, and two custom leads going directly to the batteries with a waterproof plug so I can easily hook up my voltage meter to monitor the batteries. Wait, you had a switch on that panel ? Must have been a factory option. On EE they were all fuses only, but there were single switches here and there that were in line with the fuses. They were push, twist, remove type as well. there was only one switch, (looks like it was added on), but I couldn't figure out what it went to. So I'm guessing that with the fuses, you disconnect to turn "off"? Example: if we were at anchor and I didn't want navigation lights on, I'd disconnect that fuse (Once I figure out which one it is), to turn them off? We have a separate LED anchor light with a custom plug, mounted on an aluminum pole/tube on the stern rail. There are about 6 fuses, one switch and a cigarette style plug... Everything seems to work (still have to check navigation lights). Tresa and I just did a radio check using the boat's VHF base and our handheld. She drove about a mile away and it was clear as a bell in both directions (low and high power on both). So nice to have electrical working on the boat! Still have to hook up power supply to our GPS and Fish finder (Separate fused plug leading to our house bank which will be charged with 200watts of solar.) Not ready for a permanent installation until I re-do all the wiring. We're getting close though (both in time and re-fitting!). 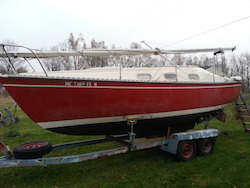 Tresa's grown son is coming over Sunday to raise the mast so I can go over the rigging... Checked our turnbuckles and found a bent 1/4" lower T-toggle on one of them!!! =O probably stepped on at some time. Ordered one from Defender and will replace it when it arrives. Sounds like you are almost there! I did get to test run our outboard though ( replaced the impeller, new oil and gear lube)... Pretty much started right up! (after 3 years of sitting! I will never use ethanol gas!) My fuel connector was dripping a little, so I'll be replacing that before fiddling with the idle (running a little too low), just in case the drip is effecting how it runs. Cleaning and replacing O-Rings in our dinghy valves before inflating and searching for leaks... The special 2-part adhesive and hypalon patches arrived this weekend. Old 10' Achilles and it leaks big time. OK... time to get to work instead of talking about it! LOL! I'll be back when I get some photos.